Depending on the severity and causes of your dry eyes, our Burnsville eye doctors can recommend various treatment options. Here are two options we often recommend, HydroEyes and Restasis. Omega-3 Fatty acids are important for overall eye health. As infants, we need these essential compounds in order to develop proper visual acuity. As adults, omega three fatty acids protect against the development of macular degeneration and dry eyes. 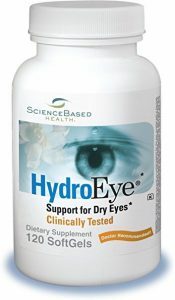 For a nutritional and natural approach to treating Dry Eyes, our eye clinic recommends using HydroEye for mild to moderate cases. This supplement contains the ideal mix of omega-3 fatty acids combined with various antioxidants and vitamins. This formula is effective in easing the symptoms of dry eyes as well as protecting against it. This blend also has the added benefit of preventing the against the advancement of macular degeneration. In cases of chronic dry often, we often see patients who have a decreased ability to produce tears. This occurs because of the constant inflammation they experience. Unlike simulated tears, Restasis is a prescription eyedrop which has been clinically proven to increase the eye’s ability to make its own tears. Instead of having to constantly replenish your eyes’ moisture, with Restasis you are actually stimulating your eyes to make more tears over time. Typically, Restasis is used for chronic cases, while HydroEye or another recommended omega-3 supplement usually can and should be used in most cases even as a preventative measure and to maintain optimal eye health. Our eye doctors are experts in treating astigmatism, dry eye syndrome, and will diagnose and guide you through the right treatment plan for you. You don’t have to continue to suffer. Book an appointment with one of our dry eye specialists today.